The Gift of Life North East Ohio sponsored medical team into Tenwek Hospital Kenya arrived in the first week of November and completed their mission on November 10th. The children’s heart surgery team was made up of members from Vanderbilt University, University of Mississippi, University of Maine, Mayo Clinic and was led by Knoxville pediatric cardiologist Dr. Michael Liske. The team performed 9 open heart surgeries and 6 catheter procedures. All surgeries were successful and each child was off ventilation within 12 hours. The team focused on training the 15 person Kenyan surgical team on all aspects of Risk Categories 1 and 2 for children’s open heart surgery with a goal to make the Tenwek team independent on future surgeries for kids as small as 25 kg. 12 year old Ian pictured “thumbs up” is near the top of his class in school and wants to doctor when he grows up. Through Rotary District 6630’s Gift of Life North East Ohio and this incredible training team, Ian is on his way. The second training team is still in Port au Prince, Haiti. Gift of Life NEO and Gift of life Manhasset Long Island have joined together for another surgical team into Haiti. This team is a result of a partnership with Akron Children’s hospital St. Damien’s Children’s Hospital in Haiti. Dr.’s Kempf and Bockoven from Akron have conducted Echo Screening of children at St. Damien’s and the surgical team from New York have performed open heart surgery in nearby Clinique Lambert. 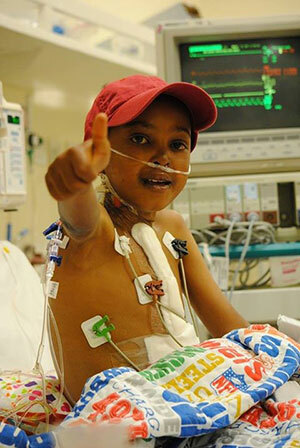 So far 5 kids from St. Damien’s screening list have received open heart surgery and are recovering. 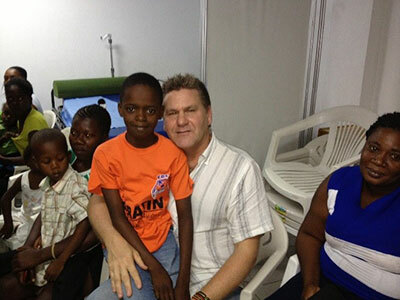 12 year old Saviola and Gift of Life International Director Rob Raylman with his family just before his surgery. Two children are expected to return at the end of the month with Dr.’s Kemp and Bockoven for open heart surgeries at Akron Children’s. More to come on this as we learn who is coming and when! Rotary District 6630 Gift of life NEO is working with Port au Prince Rotary Kado Lavi (Gift of Life in Creole) to put together both District’s first Rotary Vocational Training Team grant to bring 6 members of the St. Damien’s Children’s Hospital to Akron Children’s hospital in the Spring of 2014 for 6 weeks of skill development. Our goal is establishing sustainable congenital heart health for Children in Haiti. More to come on Vocational Training Team and how your club can get involved as the grant develops.